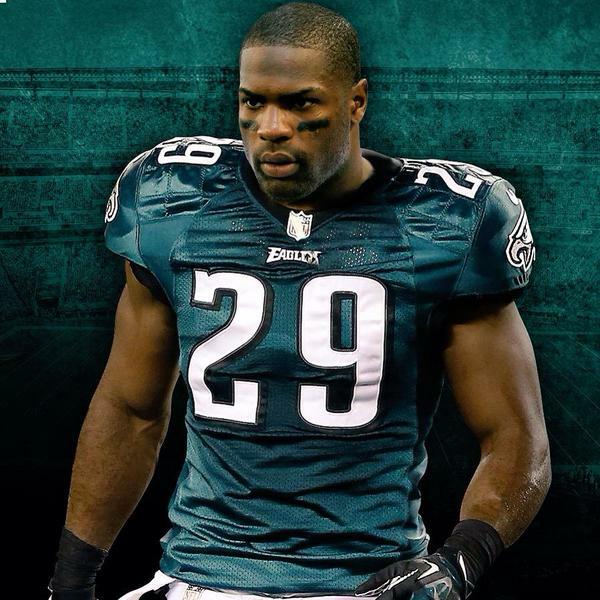 DeMarco Murray-RB-Eagles: When Murray was behind the league’s top offensive line in Dallas last season, he ran wild! Not the case this time around in Philadelphia. Besides there being a much less talented O-Line in Philly, Murray will be fighting for carries with Darren Sproles and Ryan Matthews; a whole different sort of level of competition than he had with the Cowboys. Draft with care. Julius Thomas-Tight End-Jaguars: Besides the fact that Thomas has yet to play more than 14 games in a season, he didn’t even net 500 yards in 13 appearances last season! 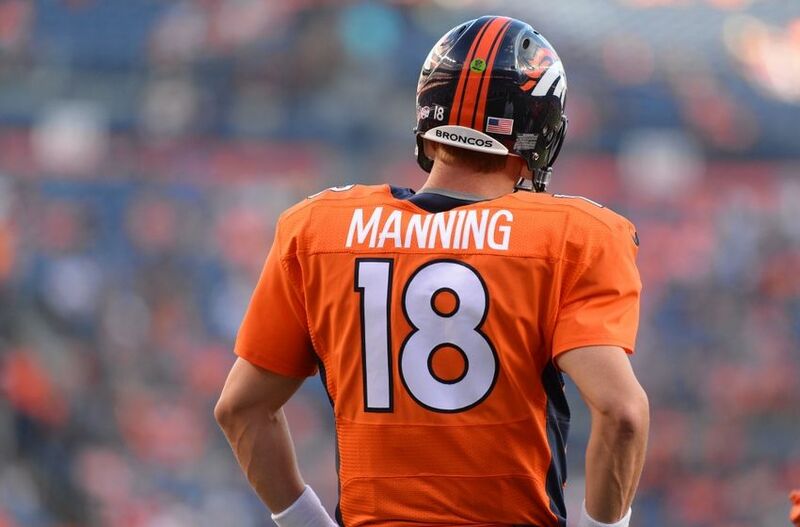 And that’s with Peyton Manning heaving the rock! Thomas will be more a Marcedes Lewis-like TE ( in terms of fantasy points) in Jacksonville with Blake Bortles under center. Just don’t expect the Thomas of old. Nick Foles-QB-Rams: The only way we can describe the receiving talent in St. Louis in one word would be “average”. The oft-injured Foles, will be under the leadership of a Jeff Fisher team which has a propensity to just pound the rock. Couldn’t get more opposite going from a Chip Kelly machine gun- like offense to the aforementioned Jeff Fisher, which will not help Foles’ cause one bit. Coby Fleener-Tight End-Colts: We can feel the eyes rolling a bit with this prospective bust pick but, come on, Andrew Luck already had a Quarterback’s dream receiving corps and that was BEFORE this year’s acquisitions of Andre Johnson and Phillip Dorsett. Just not going to be enough opportunities for Fleener with the multi-options at Luck’s disposal. A much better pick at TE would be Vernon Davis who is just two-years removed from a 13 TD season, and who has been going unbelievably late in drafts. EAGLES over the Cowboys- Unfortunately, the Cowboys have two key players listed as doubtful going into their game in Philadelphia on Sunday. 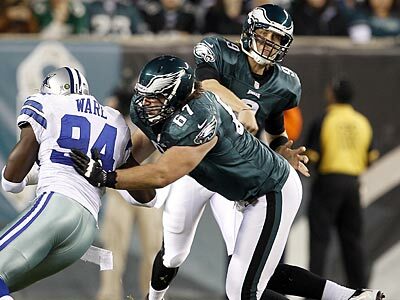 For Defensive end DeMarcus Ware (strained quad), it will be the first game that he has missed in his career. RB DeMarco Murray (sprained MCL) has insisted that he’ll play this weekend while the Cowboys have said they will be cautious with him. In either case, their defensive line is in shambles and they’ll face the high-octane offense of the Eagles with Nick Foles under center instead of Michael Vick. 49ers over the TITANS- Even though the Titans are 3-3, they have beaten a 1-4 Steelers team, an inconsistent Jets team, and a pretty decent Chargers team. They will step up in class this week and take on the 49ers who have beaten their last three opponents by 24, 31 and 12 points respectively. We don’t think that Tennessee has the defense to stop the Niners although they might slow them down, but not enough to garner the victory. CHIEFS over the Texans- Houston has been in a free-fall having lost their last four consecutive games. Beleaguered quarterback Matt Schaub (ankle/foot), will yield the start this Sunday to little known and undrafted backup QB Case Keenum. Starting your first career NFL game AT Arrowhead Stadium is no easy task especially when your team is minus -12 in turnovers. The Texans are in disarray and would be hard pressed to beat any team at the moment, let alone the Chiefs. Ravens over the STEELERS- This is an ongoing heated rivalry and every game is a war when these two teams face one another, but we’re going to go with the underdog in this one. The reason? There’s three… For one thing the Ravens have won their last three regular season games at Heinz Field. For another the Steelers win last week against rookie quarterback Geno Smith and the Jets is not that impressive. Lastly, Ben Roethlisberger has been sacked 18 times this season and you can expect the Ravens to add to that total. GIANTS over the Vikings- We haven’t been able to win once with the G-Men this season (0-2) but we think that given the improvement in their 27-21 loss to the Bears last week, we’ll give them the distinct edge. Now if only Eli Manning can have just one game where he only throws to the players wearing his team’s blue uniform, then the Giants will have a shot at winning their first game of the season. Center David Baas is set to return in the Monday Nighter and now that N.Y. has had some semblance of a running game with Brandon Jacobs going off for 100+ yards and 2 scores last week, the addition of Peyton Hillis could put less pressure on Eli Manning and his errant passes of late. Giants win their first game in front of their home crowd on Monday! A Bye week and a plethora of injuries (James Jones, DeMarco Murray, Randall Cobb etc.) afford some owners the opportunity to take advantage of these Waiver Wire Pickups… Of course your waiver wire position, as always, will play a major role in who you end up with. As this article was going into publishing, all the players below were owned in just 16% or less in most leagues. 1. 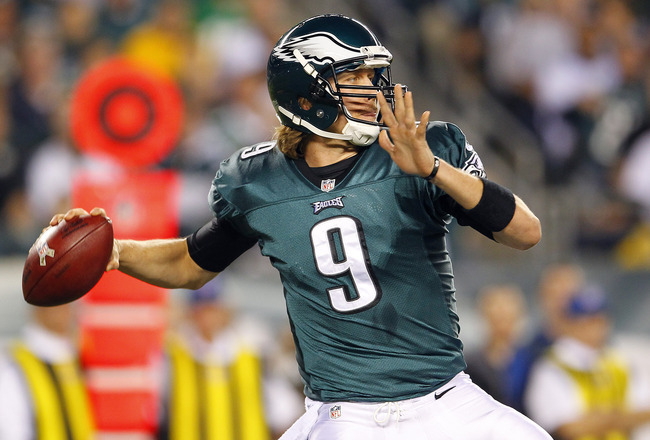 Nick Foles-QB-Eagles- 16% Owned- There is one thing that separates Nick Foles from Michael Vick…Consistency. Does anyone think that Michael Vick throws for 300 yards and three touchdowns without a turnover against the Buccaneers with a Darrelle Revis in the secondary? This week Foles is home where he’ll face a Dallas Cowboys team that allows close to 300 yards of offense a game and has also been inconsistent. We highly recommend grabbing Foles, a perfect pickup for those Drew Brees owners (bye) out there. Take Foles and his 133.3 QB rating from Sunday’s game vs Tampa Bay. 2. Joseph Randle-RB-Cowboys- 11% Owned- Safe to say that Randle will probably end up being the most added waiver wire player this week. With DeMarco Murray injured (sprained Knee), Randle becomes the Cowboys featured back in Week 7. Murray has missed nine games over the past two seasons (not including this one). Randle, just a fifth round pick, will have an opportunity to show that his 38 touchdowns and 71 receptions at Oklahoma State were no fluke. We would like to remind our readers that we selected Randle as our pre-season Sleeper for this season. We picked him because of Murray’s injury riddled past, as it was just a matter of time before Randle would become the starting back for the ‘Boys. 3. 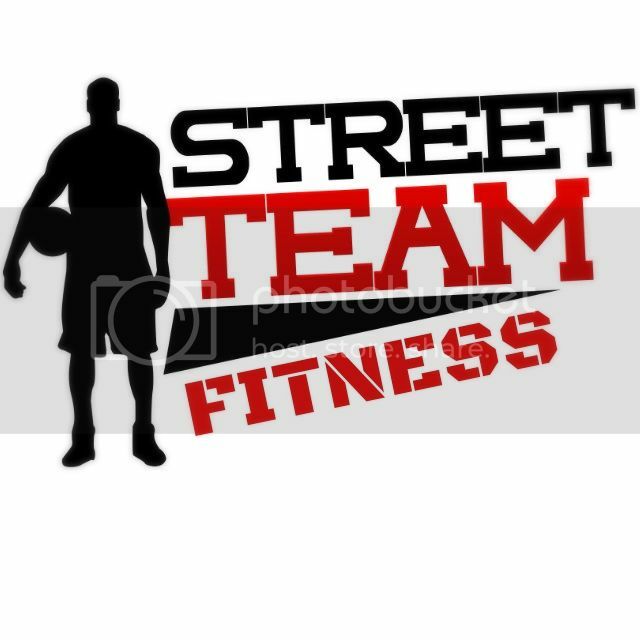 Joseph Fauria-TE-Lions-4% Owned- Fauria is becoming Matthew Stafford’s ‘best friend’ having targeted the 6′ 7″ tight end three times against Cleveland on Sunday and all three times in the end zone! Now with five touchdowns on the young season Fauria is tied for third with the most TD’s by a tight end this season. Fauria could make a fine fill-in candidate for those who will not have Jimmy Graham (bye week) starting on their roster. 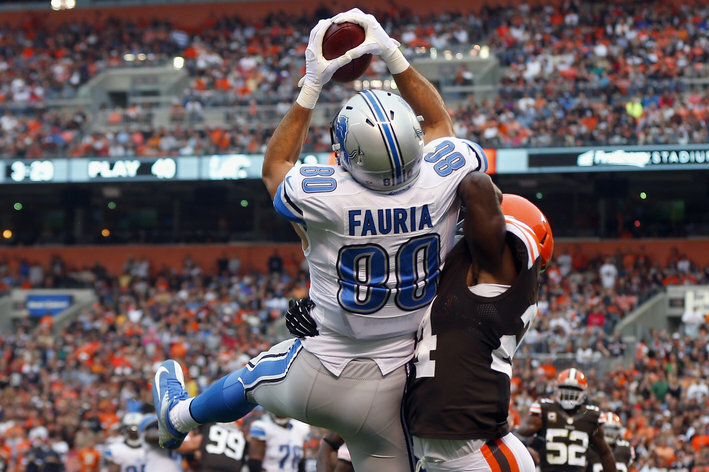 In all non-PPR leagues, Fauria is someone to consider in entering week No. 7. 4. Jarrett Boykin-WR-Packers- 3% Owned- With Randall Cobb going down with a fractured right fibula and expected to miss 6 to 8 weeks, Boykin becomes a must add for those in all formats in 12+ leagues. Targeted six times last week, with just one catch for 43 yards, you can expect him to get his fair share of passes in the weeks to come especially on a pass-happy team spearheaded by Aaron Rodgers. 5. Brandon LaFell-WR-Panthers- 13% Owned- Tailor-made for those in deeper leagues, LaFell, who just put up a season-high 107 receiving yards against the Vikings on Sunday, could make for a serviceable fill-in for those who will be without James Jones or Randall Cobb for week 7’s action. LaFell has posted three touchdowns over his last three games but buyer beware as he sees under five targets a game and so we are not touting the wideout in PPR leagues. *We have gotten over 150 emails Wednesday morning concerning the signing of RB Peyton Hillis. He has been released by the Browns, last year by the Chiefs, and just a month ago by the Buccaneers. We don’t know what he has left in the tank but at 27 you would think there’s something still there. The Giants do not possess a strong offensive line so with the exception of Brandon Jacobs’ 100+ rushing yards & two TDs last week, they have the fewest rushing yards as a team in the league. If you don’t have to give up much for Hillis he might be worth a shot given that he is essentially a low risk-high reward player at this point in his career. Just don’t have high expectations.